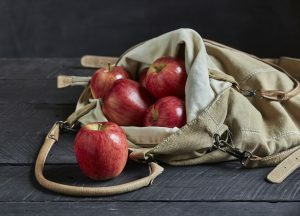 Australian apple producer, Montague, has announced it will be supplying four new apple varieties to Australia supermarkets. Smitten: A blend of Gala, Braeburn, Falstaff and Fiesta apples. Smitten apples ripen in early February making it one of the first to be harvested every year. Montague says it has a frim flesh which makes it more resistant to bruising. It will be available in selected Coles stores from February 2017.
eve: A member of the Braeburn family, the apple keeps white after it is sliced. It is grown in Batlow, New South Wales, and in the Huon Valley in Tasmania. It will be stocked by Coles nationally. envy: A cross between Braeburn and a Royal Gala. The variety has already gained popularity in Asia also retains its white flesh after cutting. It is grown mostly in Tasmania, Batlow and Stanthorpe, Queensland. It will be available May – September at selected Woolworths supermarkets. Ambrosia: A sweet and aromatic variety, Ambrosia apples were originally discovered in Canada. It has since gained popularity in other countries across the globe. The first commercial plantings of Ambrosia in Australia will occur in Winter 2016. Stockists are yet to be confirmed.Montague estimates the four varieties will produce a combined total of 12.6 million kilograms of apples by 2020. Montague is an Australian producer and distributor of apples and pears. It is the exclusive distributor of Jazz apples; a variety it first began planting ten years ago. The company also recently announced it is opening a new production and tourism development in Narree Warren North, Victoria. The facility will feature an experimental orchard and plans to demonstrate apple production to consumers. It is expected to generate an additional revenue of AUD$50 million per annum from fruit sales, increased export opportunities and revenue from the centre’s tourism and hospitality offering.